St. Lucie County, population 193,000 (2000), lies on the Atlantic Coast, roughly midway between Miami and Orlando. It contains a large amount of high quality farmland, much of which is threatened by development. The master plan created in a charrette process illustrates how St. Lucie County hopes to preserve much of its remaining rural land via TDR and the development of towns and villages. The County’s TDR program operates entirely within the TVC (Towns, Villages and Countryside) zoning district, which lies inland. The TVC contains 12,372 acres, of which 3,499 acres are within the Urban Services Boundary (USB). The remaining 8,873 acres of the TVC lies outside the USB and includes six landholdings of more than 500 acres each. The County conducted a charrette process and comprehensive plan amendment designed to curb sprawl in this area and, in 2006, adopted a TDR ordinance to implement those goals. Almost 10,000 acres in the TVC are zoned for residential development on minimum one-acre lots. The TDR program is designed to encourage a more compact land use pattern and a better mix of uses. The program allows density to be transferred within a single property or between properties. 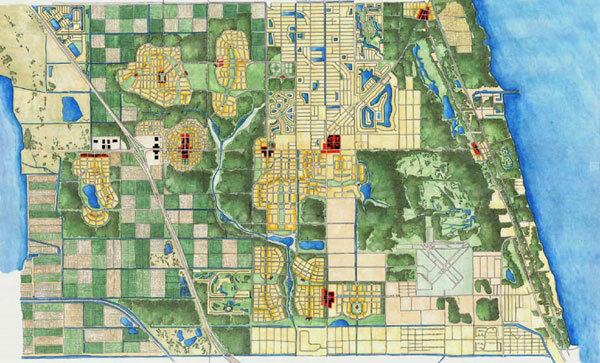 There are four inter-parcel transfer options: 1) between properties within the USB when the receiving site is greater than 500 acres; 2) from land outside the USB to land inside the USB when the receiving site is designated as a preferred receiving site; 3) between two properties that both lie within the USB and the TVC Overlay Zone; and 4) from environmentally-significant sites within the USB to sites outside the USB or from a sending parcel inside the USB that is contiguous with a receiving site outside the USB. The ordinance includes additional limitations for parcels less than 500 acres located outside the USB. Participating sending site owners record a conservation easement or deed restriction permanently limiting the future use of the property to agriculture, habitat, flow ways, parks, golf courses or civic spaces. When owners elect to sell only a portion of their available development rights, the easement or deed restriction must state the remaining number of transferrable development rights. Owners of sending sites outside the USB who participate in the program are granted one TDR per acre minus one acre for any existing dwelling unit proposed to remain on the property. Inside the USB, TDR allocation is established by the TDR ordinance. The program includes multipliers depending on where the TDRs are transferred. For example, a multiplier of 1.25 applies when TDRs are transferred from village countryside (see below) outside the USB to a receiving site that is also outside the USB. However, a multiplier of 2.5 applies when TDRs are transferred from environmentally significant land to a qualified receiving site inside or outside the USB. The code includes more than a dozen multiplier categories. The baseline density in receiving areas is established by the underlying zoning. The program encourages transfers in order to create villages and towns within the TVC. Villages cannot exceed 624 acres in size and must be at least 500 acres in size if outside the USB or at least 110 acres if within the USB. Villages must also achieve a minimum average gross density of five dwelling units per acre and incorporate 40 percent countryside/open space if the village is within the USB or 75 percent countryside/open space if the village is located outside the USB. Towns must be at least 625 acres if located outside the USB or at least 225 acres if located within the USB. Within the USB, towns must achieve a minimum average gross density of six units per acre and devote at least 40 percent of their land area to countryside/open space. Outside the USB, towns must achieve a minimum average gross density of five dwelling units per acre and devote at least 60 percent of their land area to countryside/open space. The price of TDRs is negotiated between buyers and sellers. The ordinance authorizes the county to purchase and resell or retire TDRs. Note: Some of this profile was adapted from a presentation at the 2009 National APA Conference by Professor Tom Daniels, one of the designers of this TDR program.